As work and home lives continue to intermingle, commercial spaces are blending along with them. When designing for spaces where we work, learn, and more, using color effectively is key to creating interiors that help people be as productive and comfortable as possible. Here are some tips for making the most of color in blended spaces across business, education, healthcare, and hospitality environments. Today’s open offices often include both individual work areas and communal areas that encourage interaction and collaboration. These spaces may feature generous use of natural light and sustainable elements that provide an ecological vibe and a homey, comforting feel. Such interiors lend themselves to rich, complex earth colors that are deeper in value. For example, a deep, Half-Caff brown on an accent wall adds a warm feel to an entrance area and a perfect backdrop for a company’s logo or gallery of artwork; a rich, Cavern Clay behind a high-top counter offers a coffee shop atmosphere; and a golden honey yellow creates a pop of interest alongside the grays of structural concrete in a collaboration space. 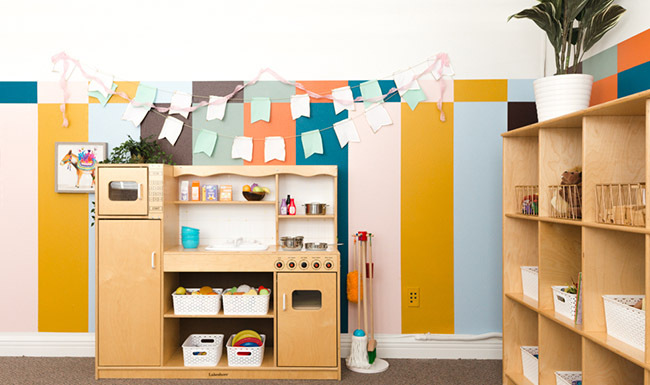 In schools, holistic, organic colors that are chalky, beautiful, and simple can create a softer effect that doesn’t distract, helping to foster a more comfortable atmosphere for learning. Colors like Sumptuous Peach, Copen Blue, and Cascade Green provide a neutral backdrop while creating a visual and sensory connection to the outdoors. These colors can be used to create anything from a cozy reading nook to a hallway for showcasing hand-drawn art projects. Pops of bold colors, used sparingly, add visual interest and stimulation to educational settings. 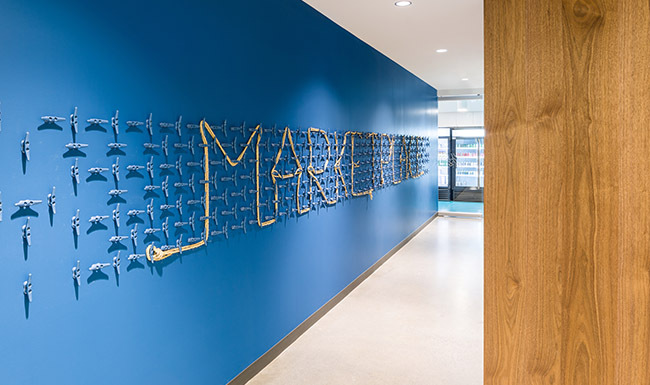 Fun, energetic colors such as Invigorate orange or Calypso blue can bring life to an accent wall or a row of storage cubbies, or can aid in wayfinding around a school campus. Different healthcare environments require different palettes to meet the needs of patients, their families, and the healthcare staff alike. In pediatric and rehabilitation spaces, vibrant colors provide an uplifting sense of wellness. A sunflower yellow, an appealing Forget-Me-Not purple, or a deep Begonia pink, applied to a ceiling, floor, or walls in a waiting area, can liven an otherwise clinical environment that has an abundance of whites and grays. For acute care areas, mid-tones that recall earthy greens, sky blues, and sunset oranges create softer appeal, along with a clean, residential feeling. Senior care centers lend themselves to colors that are more hospitality-driven, evoking a welcoming environment. Colors and finishes that are deeper in value and complexity, such as Blustery Sky blue, Tatami tan, or Baked Clay, provide for an earthy, nature-derived atmosphere and complement many types of flooring, including soft patterned carpeting, as well as wood and stone elements. The effect is soothing and homelike, with a calm feel that beckons residents to sit and read or chat with friends and visitors. When it comes to hospitality interiors, a variety of color moods – whether nostalgic or tech-driven, appeal to travelers seeking the best of the past with a look to the future. Playful colors that bring to mind the great American road trips of the ’50s, ’60s, and ’70s can provide a fresh take on retro-styled interiors. A wall of Parisian Patina green evokes the color of a classic VW van, while a breakfast bar painted in Youthful Coral brings back the aesthetic of a Mid-Century kitchen. With the popularity of rugged mountain retreats and the desire to connect with the great outdoors, colors of the forest and desert, such as Copper Mountain terra cotta, Palm Leaf green, or Prairie Grass add a nostalgic, yet updated, complement to traditional Buffalo plaids and Western patterns, offering a welcoming appeal in a guest room, self-serve kitchen, or bar area. For travelers in search of what’s next, Instagram-inspired colors such as Eros Pink or blue-green Rivulet put a modern, buzzworthy twist on anything from hotel doors to walls in cafe dining areas. In today’s commercial spaces, using color effectively not only enhances the aesthetic, but also impacts how well people work, connect, and feel while spending time in them. For more information, visit: s-w.com/marketcolors. Sherwin-Williams is one of the world’s leading companies engaged in the manufacture, distribution, and sale of coatings and related products to professional, industrial, commercial, and retail customers.. Learn more about E&I’s Sherwin-Williams contract and sign up today.